1. The last time we saw Carson Palmer, he was hurling interceptions in the NFC championship blowout loss at Carolina, so it’s easy to forget that he’s coming off an MVP-caliber season. Palmer’s mistakes tend to be in the form of baffling interceptions, and those create ugly memories. That’s the downside of a quarterback willing to throw deep-intermediate anticipation passes into tight windows. But Palmer’s aggression at those deep-intermediate levels make up the backbone of Arizona’s offense, which is the most aggressive and proficient in football. Let’s not forget: On the overwhelming majority of Palmer’s deep-intermediate throws, he’s brilliant. 2. Palmer is also brilliant when unblocked blitzers are bearing down on him. He sees that a lot in Bruce Arians’ scheme because of all the empty backfield formations. The Cards have the NFL’s most diverse stable of “empty” packages, and last year they employed them more frequently than any NFC team. All a defense has to do is rush six—or even just five, depending on the alignment—and they’re guaranteed a free rusher. It’s Palmer’s job to recognize this and react. • TONY DUNGY REMEMBERS DENNIS GREEN: The 2016 Hall of Fame inductee on his friend and mentor, a coach who saw it as his duty to make everyone around him better. 3. Because of their O-line, the Cardinals will continue to be extra dependent on Palmer, both in pre-snap identification and in post-snap reaction. It’s an O-line that was inconsistent on the left side last year (tackle Jared Veldheer, guard Mike Iupati) and is now a toss-up on the right side, with raw 2015 first-rounder D.J. Humphries stepping in at tackle and an aging Evan Mathis at guard. 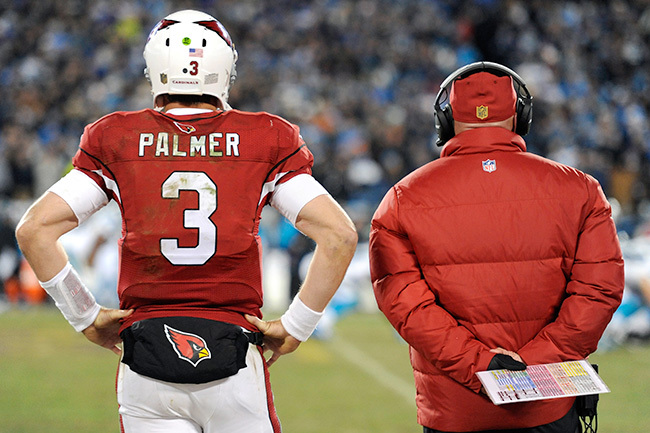 Despite a rocky finish to 2016, Palmer is an ideal fit for Arians’ system (and vice versa). 4. Larry Fitzgerald is as valuable as ever, but for different reasons than in past years. He’s no longer explosive enough to consistently shed tight coverage, but that’s not a problem because, as the movable Z-receiver in Arizona’s scheme, he rarely encounters press coverage anyway. Against man coverage, the scheme gets him open with switch releases (i.e. routes crisscrossing one another off the line). And against zone coverage, Fitzgerald is lethal thanks to a great feel for throttling down in the voids. But perhaps Fitz’s greatest value is in the running game. He’s become the best blocking receiver in football, and not just on the perimeter, but motioning down into the formation. That’s critical because it forces the cornerback to become the primary run-force defender—something no defense prefers. • BRUCE ARIANS UNPLUGGED: In a 2014 interview with Peter King, the coach opened up about getting fired in Pittsburgh, memories of babysitting Tiki and Ronde, and lessons learned from Bear Bryant, Peyton Manning and Wally Pipp. 5. David Johnson will be a top-five running back by season’s end. He’s 225 pounds of power and speed. And he’s better in the passing game than some NFL wide receivers. What’s more, he improved dramatically in blitz pickup as a rookie. 6. The Cardinals will not scale back their blitzing in 2016 despite the trade for New England’s Chandler Jones and the first-round selection of Robert Nkemdiche. Arizona’s makeup has been to scheme pressure up the middle, particularly with double-A-gap blitz concepts. It’s a Todd Bowles philosophy that Arians made sure to carry over when he filled Bowles’ vacancy with James Bettcher last year. Bettcher had to continue the trend because, aside from Dwight Freeney (now a free agent), the Cardinals didn’t have any raw pass rushing threats. In theory, that’s now changed. But only in theory, because…. 7. As a pure edge rusher for 20 key passing downs a game, the 36-year-old Freeney is superior to Jones. The latter becomes more valuable when you add in the game’s other 50 snaps. His versatility, sinewy change of direction and lateral movement in traffic, plus his football instincts, are a great fit in a scheme that employs a lot of different front and gap concepts (like Arizona, and like Jones’s previous team, New England). But in pure passing situations, Jones is a good, not great, edge bender. Same goes for last year’s second-rounder, Markus Golden, who proved most valuable as a roving standup joker in Arizona’s sub-packages. If you don’t have a pair of natural edge-benders, you can’t be a dominant four-man rush team, even if your tackles are as dynamic as Nkemdiche (potentially) and Calais Campbell. 8. Patrick Peterson is the best corner in football right now. His only bad game last season was the NFC Championship (which was the case for a lot of Cardinals). Peterson’s aptitude in iso-man affords the Cardinals tremendous flexibility in their foundational matchup zone coverages. Last season he effectively shut down Stefon Diggs, Travis Benjamin, Torrey Smith, Kenny Britt and Tavon Austin. And, equally as valuable, he held his own in solo coverage against Antonio Brown, Calvin Johnson, Steve Smith, Brandin Cooks and A.J. Green. 9. The biggest concern for Arizona’s defense is the No. 2 corner spot. They don’t want the unrefined, unreliable Justin Bethel there. But if third-round rookie Brandon Williams can’t learn in a hurry, then that’s who it’ll likely be. Second biggest concern: Tyrann Mathieu’s knee. True, last December’s ACL tear wasn’t nearly as bad as the one he suffered in 2013. If the Cardinals weren’t confident in his return, they would have found a slot corner this offseason. You don’t want a guy with a vulnerable knee having to fulfill the slot’s sharp change-of-direction demands. Nevertheless, if Mathieu is unavailable, the Cardinals have only low or undrafted fringe players to choose from there. • KEEPING UP WITH THE CARD-ASHIANS: Star cornerback Patrick Peterson and team president Michael Bidwill introduce new NFL Films series, All or Nothing, an all-access look at the team’s 2015 season. 10. Inside linebacker is another area of concern. Kevin Minter is coming off an overdue breakout season as a downhill run thumper, but he can be a liability in man coverage out of the predominant dime sub-package. He’ll play there this year, though, because there’s no depth whatsoever behind him.